Yeah, it's come out really nicely. While I have the attention, any suggestions as to what rule set might work with this eccentric mix? Will reflect the slow lumbering feel I have for these rather well, while X-Wing might be a little fast. I'm thinking I might actually end up writing a variant on command and colors style games for this. Having grid movement and relatively simple combat rules might help obfuscate the strange mix of technology levels and firepower. Between the rules for nearly all memoir '44 games being online for free as well as www.commandsandcolors.net/ having many of the other games using the system online for free as well. I think that bashing the most appropriate rules together should do well. That's a good idea re. rules - will also give you greater creative freedom. Thanks, I'm very happy with how it turned out! I'm Thinking I can avoid the whole specialized dice thing simply with a to hit number. For instance, if infantry would be destroyed it is a 5+ to hit, and 1's would force retreats. I could easily rig up stat cards for each unit type, and could much easier break units down within a type as well, for instance, both blocks of riflemen and skirmishers could count as infantry for activations. (Makes sense right?) I would need to build a custom activation deck though but that's fine. Very cool, the Swordfish II from Bebop is one of my favorite spacecraft and this is a great re-imagining. 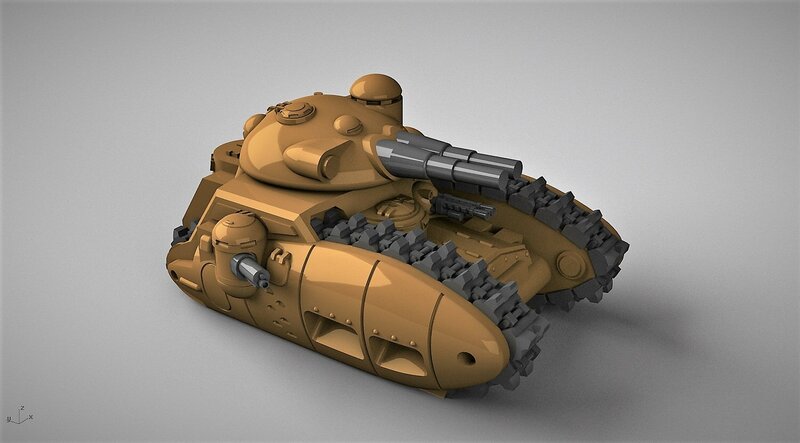 A slightly more original tank, a bit smaller than the first one, though still definitely heavy if not super heavy. I've just returned from holiday and am looking forward to finishing this bad boy and printing it. 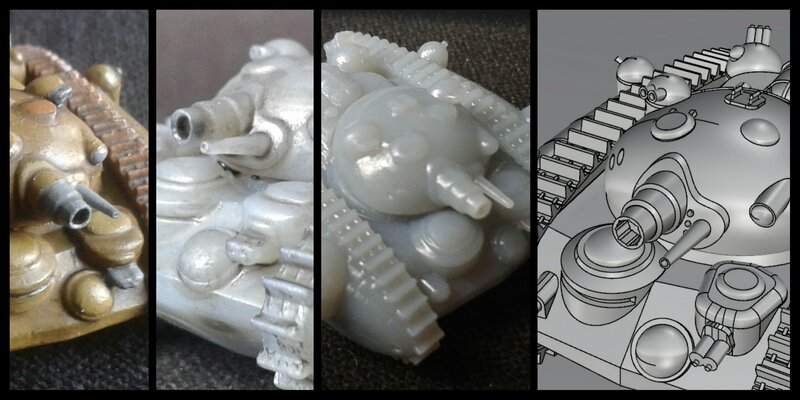 I've been experimenting with a different resin and upscaling some 6mm stuff to 15/18mm. it's a bit lacking in details, but not as much as I had feared. I'm looking at making a 1/100 sized version of the fighter now, since that one was quite popular. Lots of work to re-do though due to panel lines etc not looking great scalped of times 3. I agree - also doing organic stuff (the cape) in 3D modelling is impressive. Re: 6mm miyazaki VSF. Bike WIP page 12. It's been a long time since I updated here, but this project is still moving ahead full steam/diesel power! 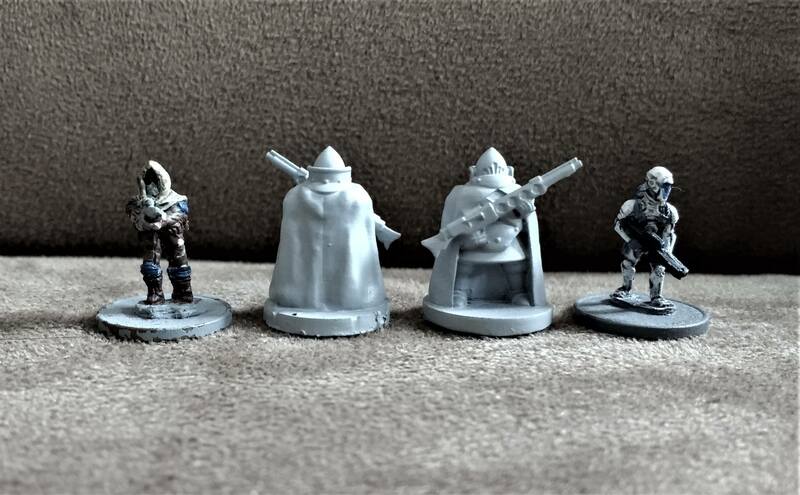 In fact, most of the things I've posted here are now in hands of Microworld miniatures with more on their way. Currently, I'm working on an APC and variants based on some sketches by a co-conspirator which should turn out really nicely, but those aren't far along enough yet to show. 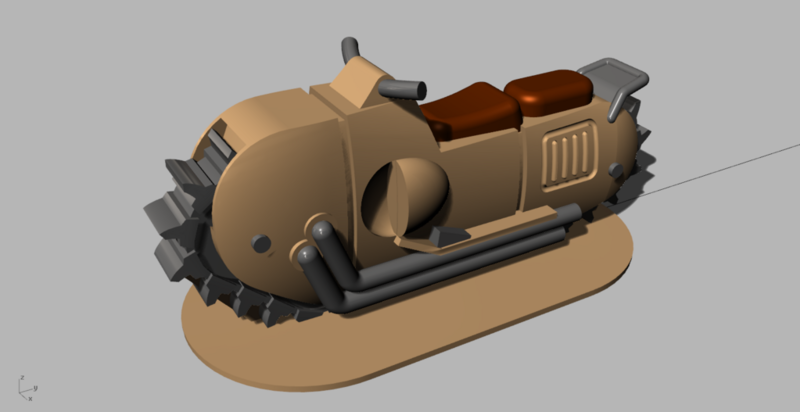 I do however have the first look at a tracked bike for this chubby tank force.